Elections are not a bad thing. But for the sake of our own commitment to honesty, let us not deceive ourselves into believing that Jordan is democratizing. 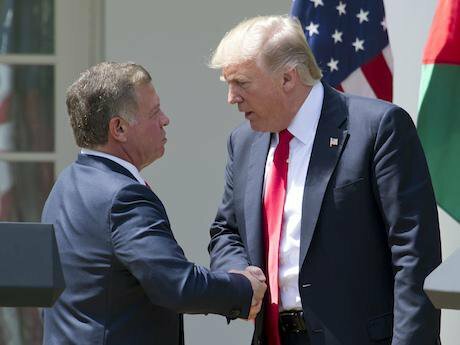 United States President Donald J. Trump, right, and King Abdullah II of Jordan, left, shake hands after conducting a joint press conference. April 5, 2017. Sachs Ron/CNP/ABACA/ABACA/PA Images. All rights reserved.A heightened sense of entitlement and an overarching belief in one’s own view of the ‘right path,’ are certainly indispensable prerequisites when attempting to implement policies that have resulted in nothing other than failure. Democracy is certainly a laudable goal, and one that people everywhere should strive for. In its singularity, democracy epitomizes freedom of expression, the agency to choose who and how one will be represented, and above all an unyielding respect for human rights. Democracy in Jordan, or at least the path toward it, has not been the recipient of those byproducts, but rather has been characterized by illusions masquerading as genuine forms of structural change—illusions enough to satisfy the United States and certainly enough to qualify the monarchy for millions in defense contracts. Since 2003, Jordan’s secret security force — the General Intelligence Department — has received over three billion US dollars in the form of defense aid and military bases in partnership with the Department of Defense have emerged in cities all across the country. With the Trump administration’s recent decision to remove human rights conditions in exchange for arms sales to Bahrain, and the administration’s recent unprecedented realignment with Saudi Arabia and UAE, governments in the Sunni Muslim world seem more comfortable today than they did in the eight years of the Obama administration, leading many to believe that democracy building has merely become empty rhetoric. The most recent maneuver to ‘democratize’ Jordan has arrived in the form of decentralization and municipal elections. Like the Washington Consensus in the late twentieth century and by extension, the seemingly permanent institutionalization of the neoliberal model, decentralization and democracy under the guise of ‘local empowerment’ have become the new rallying cry of western democracy enthusiasts. But is decentralization a necessary precursor to a strong Jordanian democracy and are elections necessarily a strong indicator of the democratic vitality of a nation-state? Not necessarily, but they certainly can be. Legitimacy of the democratic process—institution building, elections, and the proliferation of political parties—are good things, but it is the context in which they exist which makes them either good or not so good. Following verbal attacks, the group’s offices were closed by authorities in Mafraq, Karak, and Madaba — home to one of the largest Palestinian refugee camp in Jordan, an important point given that Palestinian - Jordanians are more likely to support the group. In 2016, the government shut down the group’s headquarters under the premise that the group had failed to “obtain legal authorisation” for its activities. Corruption in the kingdom is still widespread, and many Jordanians agree that decentralization will not make headway in reducing what many perceive as a widespread epidemic. On a cursory level, if corruption has been a longstanding status quo, creating more positions in the form of local elections does not eradicate systemic issues, but rather both perpetuates them and deceptively attempts to cover those issues under the guise of progress. This empty progress, for many Jordanians, is insulting to both their intelligence and their dignity. How can democracy exist in any substantive capacity — and that too when the United States attempts to impose it? After all, the United States’ record of democracy building has proven disastrous. Since the last ten years, the military has yielded significant power, often at the expense of the parliament and local decision makers. On a local level, Jordan’s push toward a constitutional monarchy, and the eventual embracement of democratic values, have been more rhetoric than genuine commitment. In January of 2017—just seven months ago—the GID arrested several former government officials and members of the teacher’s union for social media posts critical of the systemic and widespread issues of corruption in the Kingdom. Certainly no one can, or rather should, contend that this pattern of repression is one indicative of an eventual embrace of true democracy. Elections are not a bad thing. They should happen, and whether Jordanians take part in them is their decision entirely — we cannot rob them of that agency. But for the sake of our own commitment to honesty — if not for Jordanians — let us not deceive ourselves into believing that Jordan is democratizing. Jordanians — at least some — will go to the polls in August. They will cast their votes for local representatives and they will hope that at least this time their vote might mean something.